The French sculptor Claude Lalanne has died aged 93. The artist – who passed away on Wednesday 11 April in Fontaineblue – touched audiences all over the world with her animals, flora and fauna sculpted in copper and gilt bronze, designs often inspired by the vegetation in her own garden. Fashion designer Yves Saint Laurent was one of the many who were moved by ‘her ability to unite craftsmanship and poetry with equal depth’. Saint Laurent, who commissioned Lalanne in 1969 to collaborate on this autumn/winter collection, and later in the 1980s, (the only artist he ever collaborated with) was not the only major designer who admired her work: Tom Ford, Marc Jacobs, and Karl Lagerfeld were among her fans. Her unique combination of decorative design and fine art styles resonated with the fashion world. Laughter, play and fantasy were always at the centre of her work, that was, in her own words, the result of dreaming while awake. The art world delighted in her classical and baroque touches, references to antiquity, sharp wit and age-old themes – but Lalanne was in no means stuck in the past. She was a pioneer of electroplating methods, using plates of metal pressed onto each other by hydrolysis as well as a master of traditional casting. Lalanne was born in Paris in 1924, and was among few women of her generation to study architecture at the École des Beaux-Arts. She later trained at the École nationale supérieure des Arts Décoratifs. In the 1950s, she emerged as part of the last wave of the avant-garde in the French capital, and associated with the likes of Magritte, Man Ray, Duchamp and Ernst, and Constant Brâncuși, her neighbour in Montparnasse where she and her late husband, the artist François-Xavier Lalanne, lived and worked. The couple were affectionately known in Paris’ bohemian circles as Les Lalanne, also the artist name of their duo: working side by side, rather than collaboratively, they often exhibited together. Some of Lalanne’s monumental achievements in a career that spanned six decades included her sculpture L’homme à tête de chou (The man with the head of a cabbage), which featured on the cover and as the title of a 1976 album of Serge Gainsbourg. She also created a set of cutlery for Salvador Dalí which he later took credit for – the artist also took her Onion Watch and never gave it back (his wife Gala eventually returned the watch to Lalanne). Her partner François-Xavier passed away in 2008, a year after the pair had their first joint exhibition together at Ben Brown Fine Arts in London. Following his death Lalanne continued to work in the home they had shared for over five decades. She is survived by her daughters, grandchildren and great-grandchildren. 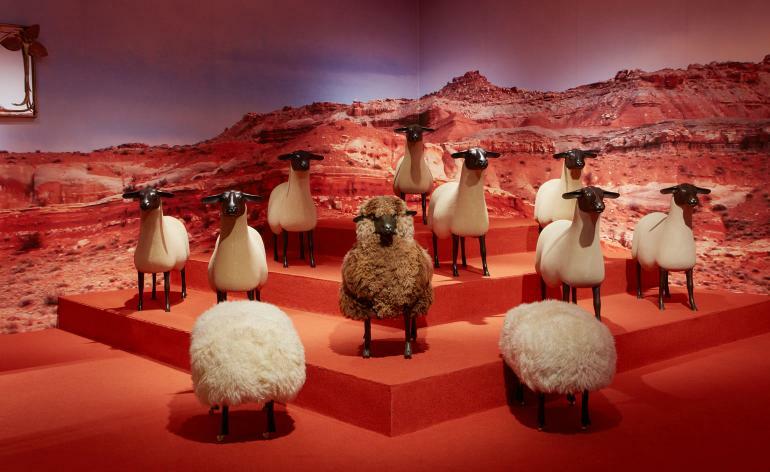 Lalanne went on to present seven solo exhibitions at the galleries in London and Hong Kong of the British dealer. In the US, she has been represented by Paul Kasmin since 2004. In a statement, Ben Brown remembered Lalanne as ‘an endlessly original sculptor’, describing a ‘great friend’, and recalling lunches together at the Lalanne’s country home in Ury on visits to France. Lalanne, he said, ‘lusciously uninhibited world which was very much her own, and to which she welcomed us’. That world included her famous cabbage with chicken feet, crocodiles you could sit on, and whimsical giant apples. She was a ‘visionary whose imagination seemingly knew no bounds’, he added.